Pursuing a master's degree in English studies will help you develop strong writing and critical thinking skills. It will also help prepare for a career in teaching, writing or editing as well as for further study at the doctoral level. You will be exposed to the wide-ranging field of English studies in courses that explore literature, rhetoric, composition, new media studies, creative writing and pedagogy. Small seminar-style classes allow for informed discussions about literature and close mentoring relationships with faculty. Tuition costs less than $15,000 for Minnesota and reciprocity students. 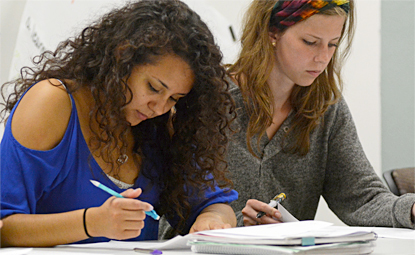 Program offers flexible scheduling with evening courses. Up to 30 assistantships available teaching first-year composition and consulting at the writing center, providing students with a stipend and tuition remission. Close student-faculty contact outside the classroom with an emphasis on advising final research projects. Successful placement of graduates into Ph.D. and MFA programs. Students regularly attend and present at professional conferences. The English Department publishes Upper Mississippi Harvest, an annual literary and art magazine and Kaleidoscope, a multicultural literary arts magazine.